It’s the same with photography… you can put good money on the counter and buy the smartest auto-everything camera around, but if you don’t know the basics you’re probably not even going to get one great shot courtesy of Lady Luck watching through the viewfinder. It all comes down to averages. I think I’m a reasonable photographer with a fairly artistic eye, a modest understanding of the science and a genuine liking for the craft. I’ve never trained to be a photographer and yet I’ve been a professional for the best part of 40 years operating within the news, publicity, retail, editorial and publishing sectors. I just got into it, learnt the ropes, practised a lot, and walked the streets looking for more work. You certainly had to understand the basics as well as learning them even if you never had to apply them directly. And if that sounds odd I’m reminded of a conversation with Heliochrome (an alternative process) creator Dunstan Perera who was equally bemused when interviewing a photography student in the UK… she hadn’t heard of either Ansel Adams nor the Zone System method of exposure and development. Whilst neither knowledge of the name or the system are necessary to get a job in the photographic industry, the fact that the student didn’t know, and worse, that her tutors hadn’t even informed her let alone taught arguably the best known monochrome photography technique of the past fifty years beggared belief. But the future generations of photographic students will probably go along the same route… why bother learning the craft and science when you can tweak an image on your computer screen using Photoshop and make an ink-jet print as good as or better (to most viewers) than a silver print from a traditional darkroom. What’s’ more, you can save that information file to disk and your children can make an identical print twenty or more years from now knowing even less than you might have done. That’s quite a revelation because I know that if I write down all the relevant darkroom data on the back of a print I’ll have trouble making an absolutely identical print the next day… because there are simply too many variables that come into play! Even if I get the paper grade and exposure time, not to mention the chemistry temperature, dilution and processing time exactly the same… there’s my mental attitude to factor into the equation. And, I may think I have a way of making yesterday’s print better today or tomorrow… that’s the mélange of art, craft and science… there’s little luck attached to it… it’s mostly down to practice! In a way I think traditional photographers and wet darkroom users (“wet” as in liquid chemistry and water washes… rather than raw novice) are very fortunate because they have a more interesting arsenal of products and techniques than Photoshop users. If you look at (and I challenge you to actually try) all of the “plug-ins” provided with computer image manipulation software nowadays you’ll soon realise that more than 95% are tricks and less than 5% are treats. On the traditional side of photography you have much more to play with when considering the number of films multiplied by the number of developers (and dilutions) multiplied by the number of papers… so the fine-tuning possibilities are nearly endless. And it’s all practice… practice… practice… perhaps for no other use except for your own pleasure. But with that pleasure you will have the satisfaction of knowing that you have made an image… and that you understood how the process worked… and that if you had made a change somewhere along the line a different and known result would have been produced… and that none of it was to do with luck. 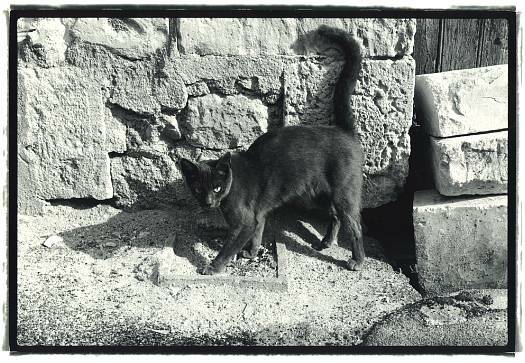 Oh yes… I almost forgot to mention the black cat… it was a grab-shot, in one of the back streets in this old French town, using a plain old Nikon F2… no exposure meter and just a standard 50mm lens. The cat bounded over the step… I raised my camera and clicked once… didn’t pause to focus, change the lens’ aperture or the camera’s shutter speed… because those fiddly controls were pre-set for the conditions, time of day, lighting and narrowness of street location. All on an auto-nothing camera with a basic standard lens… and I can count every whisker and most of the hairs on the moody moggy. Admittedly Ilford Delta 100 Pro and Xtol is a good film and developer combination to reveal most of what is there, but as I said… none of it was to do with luck! Image & text © 2004 Ed Buziak.